Hey, Portland fans! We are excited to be performing at Artichoke Music! Olalla Community Center show – loved it! What a treat to perform at the Olalla Community Center’s music series on February 11th! The venue was great, excellent acoustics and what a fantastic audience! Thank you Nolan of Olalla House, the Olalla Community Center, and all the wonderful folks who came out to our show! Watch for some video to be posted soon! Front Range Radio interview and performance posted on line! Don’t feel sad if you missed one of the rebroadcasts! You haven’t missed out! Here are links to the full broadcast and You Tube videos of the performance! Thank you to Tim Board, Producer and Host, from Front Range Radio for the links! 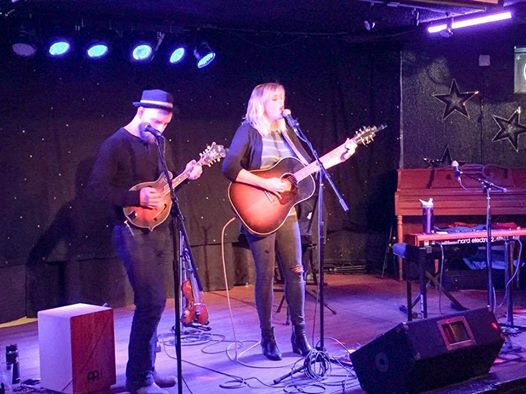 Hilary Scott was recently interviewed live by Front Range Radio while she was touring in Colorado in January. She talked about her career, her music, and performed a couple of songs during the program. The interview and performancewas recorded, and will be streamed live today, Sunday February 5th at 7 PM Mountain Time on KCMJ 93.9 FM Colorado Springs Community Radio and Tuesday 2pm MT on 365 Radio Network. Click on the links to tune in via the Internet. Hilary Scott makes Daytrotter’s “Best of the Week” list! Hilary Scott just learned that she made Daytrotter’s “Best of the Week” list! Daytrotter is a website for the recording studio Horseshack, which hosts recording sessions with many popular and typically up-and-coming acts. Horseshack, is located in Rock Island, Illinois. Hilary Scott and AJ Gennaro recorded in the studio in early January, and their session is now posted on the Daytrotter website. You can check out her session here: Daytrotter. (To listen, you’ll need to sign up…first 7 days are free, $2.99 per month thereafter…you can cancel anytime).